Beginning from the port of Kos, embark on a 2 week blue cruise journey into the Cyclades via the Dodecanese islands of magical and historical Greece. Our voyage took us to the most popular and picturesque islands including Santorini and Mykonos. We were pampered by a highly professional and dynamic crew of 6; catering to our needs while taking in the pleasures of the islands. For this itinerary we traveled with the magnificent Private Gulet Charter, newly build and in excellent condition with outstanding services, facilities and accommodation. Dishes from the galley include fresh seafood, meat and poultry dishes, a variety of vegetable dishes and appetizers, as well as seasonal fruits. All quality ingredients were offered to us, true savory pleasures of the Mediterranean cuisine. 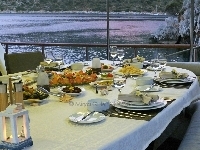 Did you enjoy Private Cruise to Santorini and Mykonos and have you been on a holiday in Marmaris, Turkey?